Looks like a fun lot to spend time with! 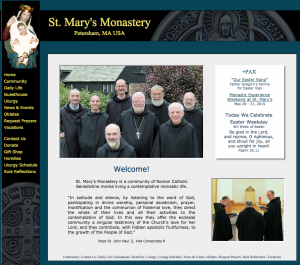 I recently received an invitation to a retreat at a monastery in Massachusetts. Maybe some day I will have the time to go. But they also are inviting young men to come and take a look. Fr. Dunstan and I met at a men’s conference not long ago. First, we are having a Monastic Experience Weekend (Be a Monk for 48 hours) for single men 18-40, Fri 29 – Sun 31 May 2015. We would be grateful if you could make this known in any way you think suitable. For fuller information, attached to a separate email are a poster, a supporting letter and a vocations flyer. We would be additionally grateful if you sent it on to anyone you think would like to know – or ought to know! 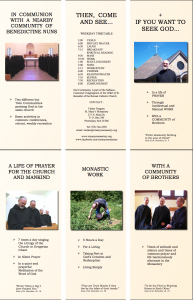 Click on this image to see "A Day in the Life of the Monks? Second. Though our community is about 25 years old, we are a little off the ecclesial radar. Most people do not know that we have a guest house. We would be delighted to see the guest house more used, by clergy and lay, individual and groups – even if only within the day. With the necessary Child Protection Guidelines followed, it is also available for school groups. But it would be especially pleasing to welcome more guests from the ‘Vocations world’: Vocations Directors, discerners, seminarians, those on pre-ordination retreats etc. Not for us to ‘poach’. We think that monasteries can be helpful places to see the next steps forward for many people, but especially so for those directly involved with finding/ discovering/ supporting Vocations. You meet a lot of people doing just that and…..
Our web site gives more details on the guesthouse, but in brief: 16 rooms, 18 bed, m & f, 1980’s student accommodation, self-catering, no fixed charge donations if you wish; divine office 7x/day and daily mass, all Vatican II but in Latin Gregorian chant with English readings; liturgy shared with twin community of OSB Sisters (a story in itself; see their web site at www.stscholasticapriory.org ; which also gives details of their similar but different dates Monastic Experience Weekend). Third, I’m (very!) English and from our mother house of Pluscarden Abbey in Scotland (www.pluscardenabbey.org). For historical reasons, there we are more involved in the life of the local Church. Guests include school groups, youth groups, clergy groups, college groups etc; plus individuals, especially individual clergy and religious; and not least, those heroic lay people whose journey to sanctity involves working professionally for the Church! Your job Steve, involves you around the engine room of the Church. And requires you to travel not just almost as much as the Pope but in fact even more than him! So you especially feel the gears of the Church clunk, hear the machinery creak…So if you – or any of your colleagues, clergy or lay – ever want to switch off the cell phone, close the briefcase and come and hide, you would be most welcome.